Saturday. AM: Modified version of Regionals Event 4. Metcon, 21-15-9, hspu, front squat 80kg, t2b. Time 14.29. PM: Skills, bar muscle-ups. The Crossfit Regionals are on their way! Next weekend will be the first weekend to host Regionals in 4 different areas. They will be held over 4 different weekends from May 9th to June 1st. The Games will be held at the end of June. There's a total of 7 events in the Regionals of which none is a walk in the park. Three events on Friday, and two events on both Saturday and Sunday. I found the combination of these events very cool and challenging, and they definitely cover a wide variety of movements in the field of fitness, looks good!!! We have to bear in mind that those guys entering Regionals are beasts, physical miracles of human beings. They've done a lot of work and they have each and everyone earned their spot in the top of each region. Thus, the workouts must also be challenging, they must really put these athletes on a real test. That's why these workouts are very challenging to a regular crossfitter like myself. In order to succeed there's a lot of requirements for strength, high-skill gymnastics movements, speed, muscle endurance, and tolerance of pain. None of these workouts are easy. None. I applause to Dave Castro who is the man behind the crossfit competition programming. 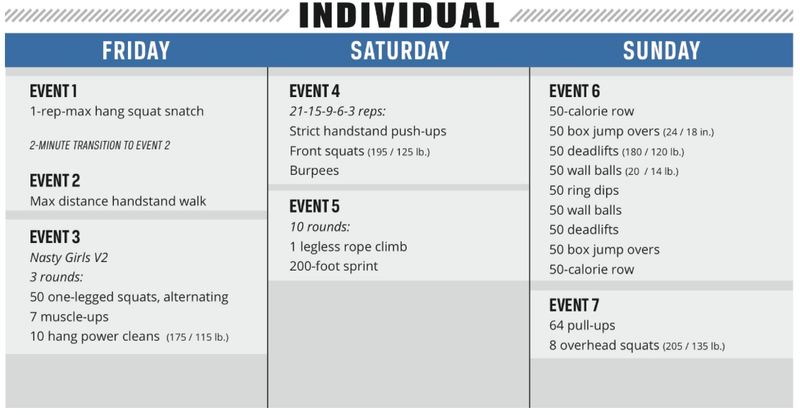 Two workouts caught my attention, events 4 & 6. These are both something I'd like to try out. Some modifications still need to be done for couple of reasons. First, my strength level is not enough to hassle through the workouts in the sense they should be done. Having me do 45 strict push-ups with fatigued shoulders is a no go. It would take an eternity and the whole point would be wasted. My engine would not be in test, it would be mostly a test of shoulder strength. Coming back to the workout of the day, 21-15-9 of the triplet. It was tough! On handstand push-ups I did 15 reps in a row on the first round, then 3+3 with short recovery in between. My max consecutive is 18 reps, just to give some perspective. On the second round I nailed 7 reps on first attempt, then 5+3 to finish the round. Last round was 6+3 reps. It felt like I didn't rest that much but I guess the reality is a little something different. Uuh, and the front squats, yammy. I took the bar from ground in the beginning but then racked it as I needed the rest. There were other people at the gym and I wasn't able to drop the bar. I usually hold the bar with just two fingers when front squatting and it's difficult to re-grip when lowering the bar from front rack position. I was lucky not to drop the bar because every clean would have been nasty in that condition. First round was 10+6+5, second was 9+6 and last one 6+3. Had to rest between sets to get my legs and shoulders back in the game. It was surprisingly tough on the shoulders too, to have the bar in front rack. Toes-to-bar was obviously the easiest of these. I went unbroken on these ones and didn't have any issues whatsoever on this movement. Had one no-rep in the last set as my toes didn't touch the bar simultaneously so I did one "extra" rep. This gave me some perspective on the feelings over the Regionals. This was much lighter version of event 4, and having to do 2-3 workouts per day of which each is cruel and a mind-blowing test of fitness. I look up to these guys and appreciate the work they go through in just a few days. I went for a recovery run to flush my legs that felt quite stiff after yesterday's squats and today's workout which also included lots of front squats. I ran / jogged / walked around for couple of kilometers and ended up at my "hidden pull-up" place =) I wanted to work on this gymnastics skill because I tend to land over the pull-up bar with my right side first so it's unbalanced. That's not a good thing and needs to be corrected. I have hard time training this at the gym because the wall is too close and I need rather big kip to get those muscle-ups done. So I'll try to find a pull-up bar outdoors to work on this one until my skills are so good that I can complete this with smaller kip or even strict. I started by doing couple of pull-ups, then chest-to-bars, little by little pulling myself higher until the reps were more like belly-to-bar. Then I remembered how to do bar muscle-ups theoretically correctly. Hold the feet together, swing forward, and once you swing back bring knees to the chest and kip as fiercely as possible. Or something like that =) The point being that I haven't kept my feet together and only my right leg has done some sort of kipping movement. It hasn't been my entire hip that has worked properly. I've mostly pulled myself up there and it hasn't been beautiful. I've learned how to do these without misses but it hasn't been as economical as I'd like to. Today I understood big things and was able to get first muscle-ups ever with proper style. Even though I've done tens and couple of hundreds of those today was the day I got my first "beautiful" rep. That was a big thing!